Wireless security cameras are a great option if you don’t want to run wires through your house. Running wires can be difficult and you always run the risk of needing to do extensive repairs. If you are renting property, running wires might not even be an option. Also, if you have to move your cameras somewhere else for whatever reason, it won’t be a huge hassle. Imagine spending all day hard wiring a front porch camera only to test it out and the angle is completely wrong. I’m sure this happens all the time. Anyways, because of these and many other reasons a lot of people opt to use wireless cameras. The obvious drawback of using wireless cameras is the heavy network load, especially if you’re streaming live video 24/7. So what can you do about it? Most of the time, ISP supplied devices are not designed for anything but casual home use. Actually sending high quality video over the network is pretty hardware intensive and most routers and firewalls tend to hit their CPU limits fairly quickly. For modems, DOCSIS is the standard for its data bandwidth capabilities. If you’re just running a few cameras, but you want to be able to do some live streaming, a DOCSIS 3.0 modem should be plenty. If you are planning on expanding to more than a few cameras then you will probably want to upgrade to 3.1. Again, most routers are not built to stream high definition video over the network while simultaneously handling daily internet routing. You have a few options here, but generally the easiest way to handle your camera streaming is to give them a separate wireless bridge which connects to your main router. With this method you can expand to as many cameras as you want, all you have to do is add more bridges. Another bonus to this method is how cheap it is. You can get a refurbished DD-WRT supported router for under $10 and use it for all of your live video routing. Keep in mind though, the bigger your wireless camera network gets, the more complicated this will become. If you don’t want to deal with changing the firmware on a router you can always buy a wireless PoE access point. Just make sure to point it toward your IP cameras. If you don’t want to change your current network infrastructure, consider using a higher video compression. This will lower the quality of the video, but it should reduce a lot of the pressure on your wireless network. 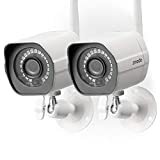 This would be a good option for day to day use, but if you plan on using your cameras for security, it’s recommended to have the highest video quality possible. It’s possible that the delay is based on your hardware. If you have a network that should be capable of handling the video or you are using a bridge then it’s likely that your hardware is struggling to decode the video feed. The easiest solution to this would be installing an NVR to your network. Similar to a cable DVR this allows to store and play back video on the fly. An NVR connects to your network just like the IP cameras, so it wouldn’t be a bad idea to have it connected to a bridge also. The whole point to video monitoring is to protect your home and family. If your cameras are not set up correctly in your network, it could mean disaster and loss. Most people don’t want to deal with all of the technical troubleshooting and often seek an easier option. Consider asking Protect America for a free quote on their professional security camera options. No need to upgrade anything and you’ll have a professional looking out for your home 24/7. Get a free quote today!